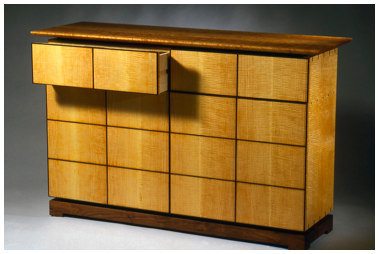 captures the essence of shoji screens in a bold contemporary form, and offers a variety of shapes and sizes in both vertical and horizontal models for almost any use: buffet, media/electronics, books, office credenza, art display, you name it. Tell us how you’ll use it, and we will help design a model to fit your needs. 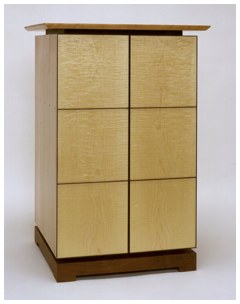 Yoda Cabinets feature pairs of hinged doors, made of bookmatched Curly Maple with either Wenge or Walnut beadwork trim. Spring loaded magnetic door catches open and close with an gentle push, eliminating the need for handles that clutter the design. 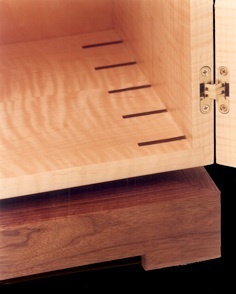 A variety of interior shelves and drawers can be added to enhance the function. 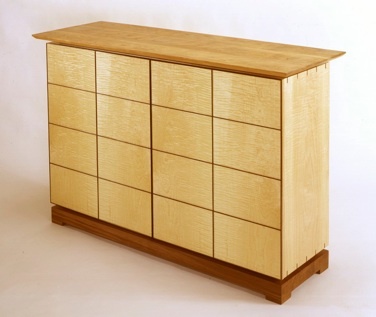 As with our Sliding Door Shoji Cabinets (see previous page), your Yoda Cabinet can be built on either our “tall leg base”, or our standard low base, and can be sized to virtually any dimensions you require. 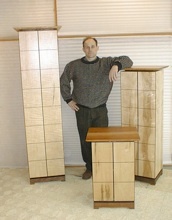 Similarly, wood choices for the base frame, cabinet body, and floating top are up to you, depending on availability. Walnut base (low), floating top of Cherry. Doors are bookmatched Curly Maple with Wenge beadwork trim. 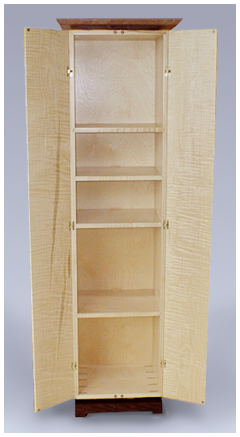 Comes standard with 2 adjustable shelves. Comes with 1 adjustable shelf. 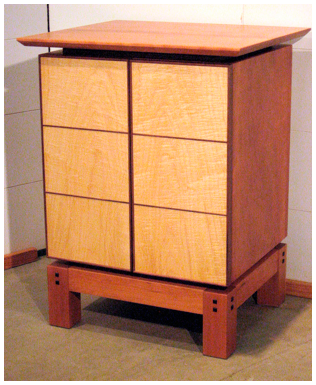 Cherry base (tall base option), Cherry cabinet body and floating top. Comes standard with 1 adjustable shelf. 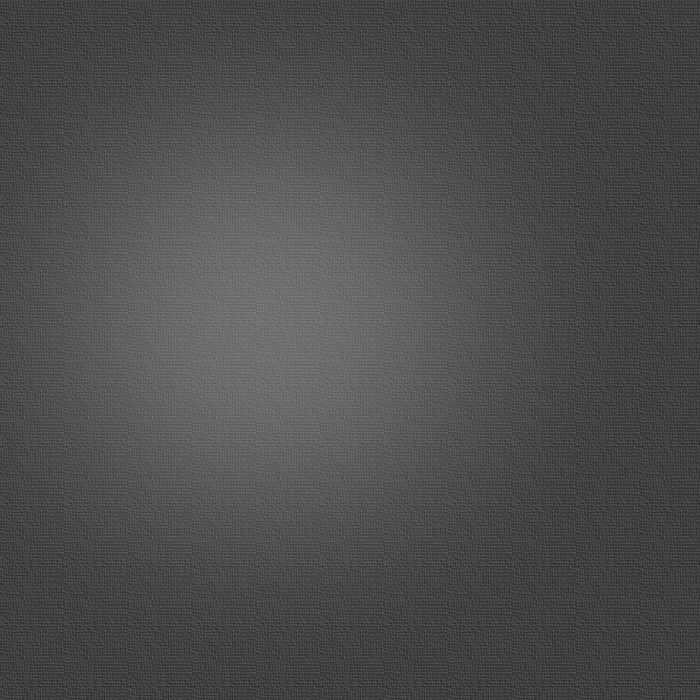 (see photos above for examples of our standard low base). Hidden Soss Hinges come standard on many of our Yoda Cabinets with narrow doors (no wider than 14”), such as our nightstands below, and the original Short Yoda above. When the doors are closed, the hinge is totally concealed from view. With doors open, the hinge reveals itself, masterfully inlaid into the edges of the door and cabinet side panel. Minimalist and unobtrusive, they allow the door to be opened a full 180° for easy, unrestricted access to the interior of the cabinet. Gravity being such that it is, mounting these doors so that the horizontal beadwork lines up perfectly from door to door gets trickier as the door gets wider and heavier. For the wider, heavier doors such as those on our Yoda Buffet cabinets (above), we prefer to use adjustable European Hinges. “Euro” hinges are also totally hidden when doors are closed, and allow us to perfectly align the doors after hinge and door are attached to the cabinet.